If you are considering the purchase of a security video system and are unsure as to whether you should purchase a DVR or a CCTV digital recorder, you MUST read this article. In the following text we'll answer this question and many more about CCTV digital recorders and describe three of Security Camera King's featured units. If you are considering the purchase of a security video system and are unsure as to whether you should purchase a DVR or a CCTV digital recorder, you MUST read this article. In the following text we’ll answer this question and many more about CCTV digital recorders and describe three of Security Camera King’s featured units. So to answer the original question, DVR or CCTV digital recorder? The answer: They are both the same device; whether it’s called a DVR or CCTV digital recorder, it’s still the same piece of equipment. The terms may be confusing because of the evolution of the video security system. Originally, video security camera systems were analog systems. The video camera was basically just a small version of a television studio camera that was used to record analog video. The term “CCTV” or Closed Circuit TeleVision was used to indicate the difference between a television studio camera that broadcasted its signal via OPEN radio signals to anyone that wanted to receive it and a video security camera that used a CLOSED circuit to send its signal to a designated device. Analog systems used video recorders, but they recorded the signals using analog methods on tape, such as VHS or Beta. These analog system recorders were either referred to by the tape type designation or were simply called video recorders. Current video security systems are digital systems. The recorders that are used in these systems are called Digital Video Recorders or DVRs. Basically the terms DVR, CCTV DVR, Digital Recorders, and CCTV Digital Recorders all refer to the same device, a digital video recorder. There are several advantages to a digital system as compared to an analog system. CCTV digital recorders can instantly jump or skip to a specific time or date recording. Analog tapes had to played and searched while playing to find a specific segment. Digital recorders also save video in digital or binary format so there is no degradation of the quality of the recorded video over time. All three models of CCTV digital recorder use the H.264 CODEC. CODEC is an acronym for COmpression/DECompression. Digital video security systems create digital video files which consist of nothing more than several digital photographs taken in succession in a short period of time. High-quality fluid digital video is often taken at a rate of 29.9 pictures per second or frames per second or fps. Consider the potential size of a file for one digital photograph; now imagine if you took 30 of these per second. In 60 seconds you would have an uncompressed digital file 1800 times the size of one picture. This size ratio is far too big for even the fastest processors to handle, so the CODEC is an algorithm that is used make this files much easier to handle and store by shrinking their size without sacrificing quality. The H.264 is the latest, most efficient digital video CODEC available. 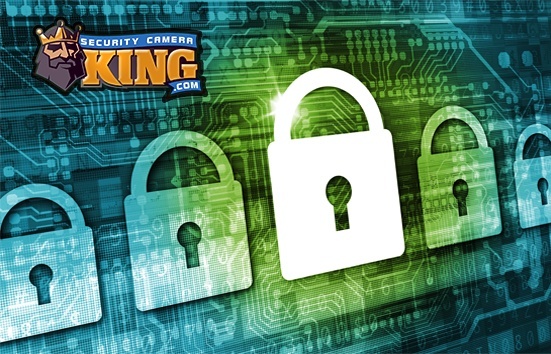 All three of Security Camera King’s CCTV Digital Recorder models feature an embedded Linux operating system and Internet Protocol (IP) ready features that include internet networking, e-mail alert notification, and access via one of several varieties of smartphones. Our CCTV digital recorders are standalone systems; they can operate without the use of a personal computer (which could be vulnerable to viruses, hacking, and other invasions). In addition, all of our featured CCTV digital recorders have HDMI, VGA, DNC video outputs with a display resolution of 720 P. This means that more than one monitor can be used with the unit at a time. In fact, with the included Matrix output you can pick and choose your monitor display options. Our CCTV digital recorders are easy to setup and operate. Their software is a mouse-based point-and-click Graphical Users Interface with an On-Screen Display. The operation is so simple that there is even an included infrared remote control. For additional information about our CCTV digital recorders, please contact one of our security experts.